Minneapolis, MN – The University YMCA, a leading nonprofit dedicated to strengthening communities through youth development, healthy living and social responsibility, will host two events in recognition of Native American Heritage Month in November. In partnership with Word Carrier Trading Post, a publisher specializing in Native American literature, the University YMCA will host a book fair with titles ranging from preschool to college level. Word Carrier brings the written word to schools, communities and homes. The book fair will be open to the public from 12 p.m. to 5 p.m. on Friday, December 1. The University Y will also partner with the Minneapolis Division of Indian Work and the Bdote Learning Center to host a campus visit for 70 students in Kindergarten through 6th grade on Friday, December 1. The trip was planned by participants in the Y Innovate youth mentoring program at Bdote Learning Center, which develops leadership and deepens appreciation of the environment through experiential learning activities led by college students. 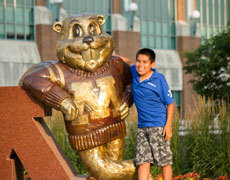 On their visit to the University, the students will receive a free book, visit the Tribal Nations Plaza, tour TCF Bank Stadium and engage in art, science, physical activities and college readiness activities at the University Y.
Friday, December 1 from 12 p.m. to 5 p.m.